If you've ever wanted to know how to create an easy taco salad recipe, then you've come to the right place! This recipe is great for busy people! Having good food to eat while being busy can be difficult to balance out, and sometimes seems impossible! Fortunately, there have been many great recipes that you can make at home to make your life easier and full of delicious food! 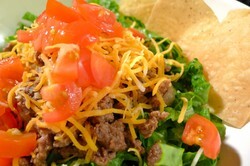 This is an easy taco salad recipe that I've used over and over again to have great food in my stomach. I highly recommend this for anyone that has an on-the-go lifestyle. To get your taco salad ready, you need to start getting the ground beef (or chicken) cooked and ready for the meaty part of this meal! I recommend getting a pound of ground beef or a full can of chicken to have some for later whenever you want some. Grab the best non stick frying pan you have in your kitchen and start cooking that meat! Once you have all the ground beef separated into nice chunks, you'll want to put the taco seasoning on there to let the flavor soak in. While the meat is cooking, now would be a good time to start cutting up that lettuce! All you need to do is chop up how much you think you'll use and save the rest for another time. When the meat is done, you are now ready to set up your easy taco salad recipe! 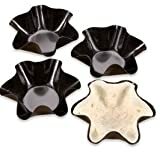 Grab a big, round bowl to put your taco salad in. Now put the Lettuce in first so the meat doesn't fall to the bottom. Then place the tortilla chips for the extra crunch and saltiness. Crunch up the tortilla chips so they don't take up the whole bowl. You can do it without the chips if you want to avoid the carbs as much as possible. I like the extra saltiness and crispness of them. Put the meat in next, and spread it evenly across the lettuce and tortillas to ensure you don't put in too much or too little meat. I personally like a lot more than most, but you choose what you want. I know that some people like to put in a little refried beans in there too, so you could add a little of that in there if you like. I do on occasion, but I'm usually in a hurry so I skip that item. Then sprinkle as much cheese as you want in there to have that nice dairy taste! And to top it all off, put the salsa on! If you have anything else that you enjoy putting on there, go right ahead and add your own extra stuff! And Congrats! You're done! What Do You Put On Your Taco Salad? Is there something that you put on your taco salad that I didn't write up here? Let us know what it is! Here are some other recipes that are quick and easy for you to try! I use this ALL the time when I'm making something quick and easy. This is a recipe that I created to help make something easy as well as being on the healthier side of most foods. I would definitely give this a try if you haven't already! I am a bit of a health nut, and eggs are the perfect part of a high-protein breakfast that's also easy to make. The only issue I ran into was that it eventually got bland really fast. With these 10 different recipes, I found a nice change to my eggs, and I fell in love with them once again! Be sure to check it out! Yes, Indeed! I love making this for my family and friends. It's just easy and everyone loves it! Thanks for the comment!